The AUralization and Reproduction of Acoustic Sound fields (AURAS) facility is a 32 channel loudspeaker array for acoustic simulation. 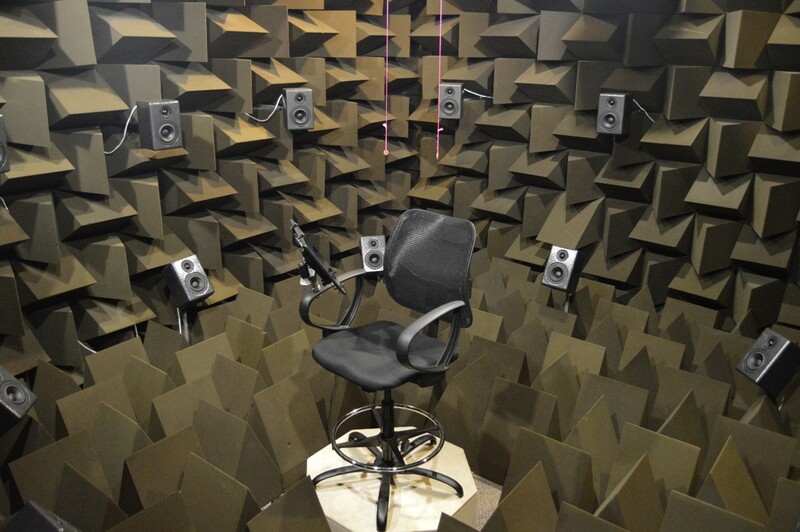 The loudspeaker array is built in an anechoic chamber at Penn State, and it consists of 30 distributed loudspeakers and two sub-woofers. All channels of the array are controlled independently, and can be processed for any type of virtual acoustic reproduction. The array is controlled with a 32 channel digital to analogue converter, and powered by three 12 channel amplifiers. The AURAS facility is used to conduct subjective studies in concert hall acoustic perception, through both reproduction of measured halls and simulation of virtual halls. Using the Eigenmike, higher order ambisonics allows us to reproduce the measured sound field within our array. Subjects can sit within the array, listen to different concert hall auralizations, and rate the auralizations on different subjective perceptions. 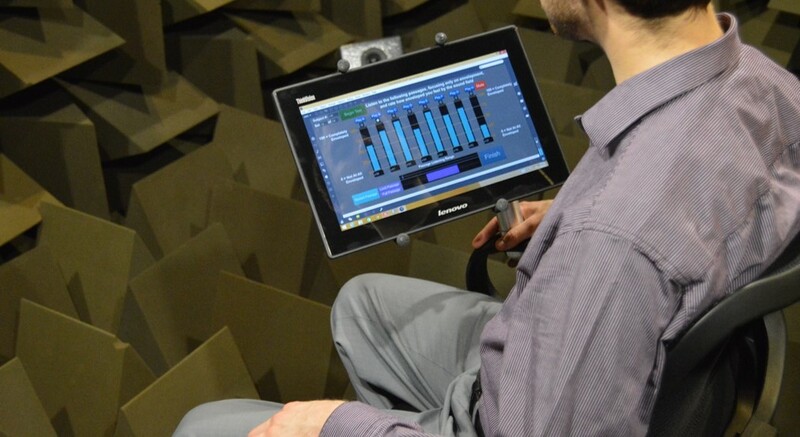 The facility is equipped with a wireless touchscreen monitor, allowing subjects to answer questions about the concert hall simulations and interact with the sound field. Max 7 has been used to control the loudspeaker array, because it which enables real-time switching between concert hall stimuli and easy-to-use interface development. The construction of the array involved the individual construction of all 30 loudspeakers within the facility, and individual equalization of each loudspeaker to ensure as accurate sound field reconstruction as possible. Each loudspeaker is controlled through a USB interfaced digital to analog converter and three multi-channel amplifiers. The facility was also built with a height-adjustable chair, for accurate subject positioning. Neal, M. (2015). “Investigating the sense of listener envelopment in concert halls using third-order Ambisonic reproduction over a loudspeaker array and a hybrid room acoustics simulation method.” M.S. Thesis, The Pennsylvania State University.